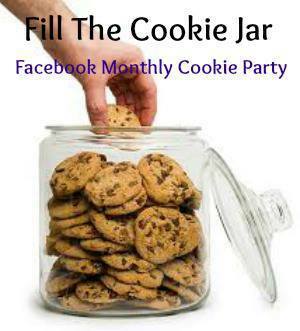 The theme for June's "Fill the Cookie Jar" is cookies that our dad would love. I was running REALLY far behind this month, and when I needed to decide on a recipe, my dad was out of town.... Ooops! So, I turned the decision making over to Truckin' Man. His suggestion was "chocolate chip". While chocolate chips are the best cookies, it wasn't one I felt inspired to bake recently. Then I had a memory.... A bar I had pinned several years ago. Apparently almost 4 years ago. Has pinterest really been around that long? Wow time flies..! Anyways.... I found the pin, and the link was dead. I was heartbroken. Don't tell me I can't have this recipe. Nothing like a dead end to get me obsessed with finding the recipe. It took a bit. I ended up having to get creative on my surfing abilities, but I found the blog, and the recipe. Thank goodness! Man Bars. Doesn't that sound like the perfect bar for celebrating Father's Day? From all the guys that sampled this bar today, the name fits. It's sweet and chocolaty, with the perfect graham cracker goodness that everyone loves! Preheat oven to 350 degrees. Line an 8x8 baking pan with parchment paper, set aside. In large bowl, mix together graham cracker crumbs, cocoa, chocolate chips, walnuts, sweetened condensed milk, and vanilla. Stir until all ingredients are combined. Press into prepared pan. Bake for 30 minutes. Let cool. Remove bars from pan, and cut into small squares. 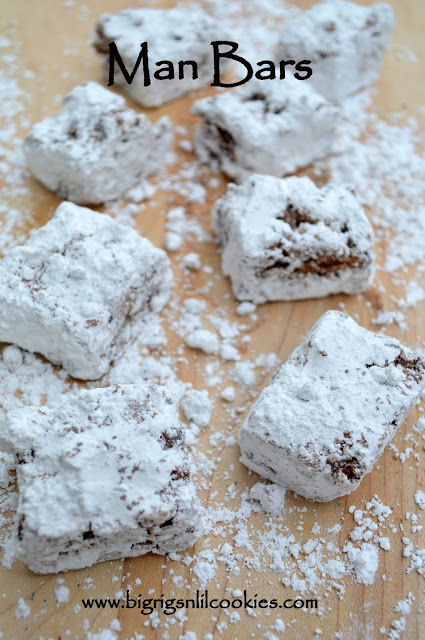 Add powdered sugar to small bowl, and roll bars in sugar before serving. I don't make a ton a sweets but the name cracked me up! Love it! I have all the stuff here to make these! Great idea! Oh these sound fabulous with the graham crackers and chocolate! And the name is perfect for the Fathers theme. I love, love, love the name of these bars. As soon as I saw the title in the link up, I knew this would be bar that you made! It is so you and I think they sound delicious! I am glad you were patient and kept surfing the web for this recipe! I am also glad you are a part of the Fill The Cookie Jar group. I always look forward to seeing what you bake! Yummy! These look delicious! I was looking for an end of the year teacher gift and these look like they would fit the Bill - as long as I don't eat the whole pan before giving them out! Yummy! Might just bake these for my husband's birthday. They look fantastic! I am so going to make these this week. We need a new treat. Perfect! OOOO - I love the ingredients! Surely the cookie would be delicious for we WOMEN too huh? Thanks so much for sharing this simple recipe at Weekend Potluck. Please come back again soon. Thanks for stopping by the Say G'day Party and sharing! Pinned all your submissions and look forward to seeing you next Saturday!! I keep forgetting to make my cookies all the time. Anyway these look yummy. These look amazing - your dad missed out! How large (or small) do you cut the bars? I can see adding some chopped pretzels to this and maybe substituting the messy powdered sugar with a cream cheese glaze drizzle. Sounds really yummy but I think the name should be OH MAN Bars LOL. For myself, I cut them about 1 x1, for my husband they were bigger about 2 x 2. Whatever works for "popability"! 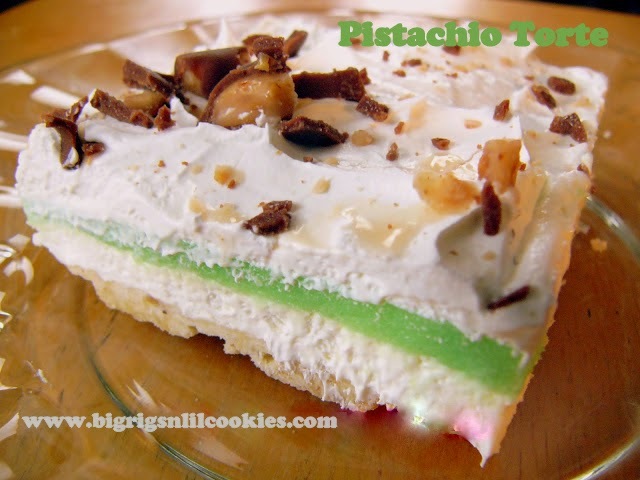 LOVE your cream cheese idea! My grandma used to make these many years ago, except she called them Aunt Vera's Cookies. And I think hers might have had chopped up dates in them. They are so addictive!! Just seeing your pictures makes me crave them :D I haven't made them in a long time because I can't have dairy anymore but I think I'm going to have to make some nondairy sweetened condensed and mix up a batch this weekend. Mmmmmm!! These were a 'Christmas cookie' at our house growing up. My mother made them starting in the 1960's. Don't know where she got the recipe but they were known as 'Deadlies' to us. Susan ~ Once baked, they should have set up just fine, but could have been a little "doughy" in the middle when just out of the oven. Being the only moisture comes from the sweetened condensed milk, it isn't a very moist batter.